Providing your body with the energy it needs during a race can be one of the trickiest things to figure out as a runner, but if you plan to run half marathons, marathons or ultras you have to figure it out. There are many fuel options, how do you know which one will work for you? You don’t the only way to figure it out is through trial and error, but where to start. The various products out there use different types and combinations of sugar such as dextrose, Maltodextrose, and fructose. Some people have a harder time digesting some sugars more than others while running. When you are running, your body’s primary focus is pumping blood (fuel and oxygen) to your muscles. Digestion also takes blood, and your body is reluctant to shuttle much blood away from your muscles, so if you eat something that is difficult to digest or heavy, it will just sit there bouncing around. There are lucky people out there who can eat just about anything while running and never have to worry about it. There is hope for those of us who cannot. You can train your stomach to digest while running, which brings us back to what to use. Start with asking your fellow runners what they use or go to a running store and ask for suggestions. 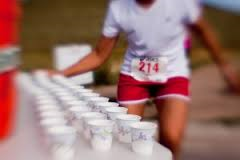 If you plan to use what is supplied at your goal race, you should be checking their website or emailing the race director prior to the race to find out what that is. You do not want to eat something during a race for the first time. It doesn’t really matter where you start gu, hammer gel, shot blocks, sports beans, stingers, or waffles. Heck, you can start with real foods that are easy to carry jelly beans, M&M’s, quartered peanut butter and jelly sandwiches, or fruits. The benefit of the manufactured products is that they are made to be easy to digest, which means they require less blood to your stomach to get into your blood. The other half of the equation is how frequently do you eat while running. For things that are easier to digest you will need to eat them more frequently because they go through your system more quickly. Your body weight and your pace also change how often you must take in fuel. The more you weigh the more you will need to maintain your pace. The faster you run the more you will need to maintain your pace. Runnersconnect.net does have their “Marathon Nutrition Blueprint,” which calculates how many calories you need to take in and when during a race. I’ve never used this, but it is out there if you want to give it a try. This requires practice. When you go out for your long runs try different fuels and the timing of them. You can try them on shorter runs as well, but the long run is going to give you the best idea. For a shorter run, eat whatever it is five to ten minutes before you start. You may try one and immediately know it will not work for you because of texture, ability to chew it, or nausea. Others may take your body a few runs to adjust to digesting. Remember to drink water before and after you eat something. It will help with digestion. If you use a sports drink rather than water, keep in mind that it also contains sugar, so you may not need to take something else as frequently. Low carb is another matter entirely. The central idea behind eating a low carbohydrate diet is that your body can use fat as energy and it has at least 40,000 calories of fat even if you only have 6% body fat. However, like with anything else you have to train your body to use fat as fuel. This requires eating low carb all of the time not just during a run. Some low carb runners don’t need anything but water and electrolytes to run, especially for the half marathon or the marathon. When you get to ultramarathons, even the low carb runners typically need to eat something. There are a few low carb options out there like Vespa, the almond butter mixes, and a few gels with lower carb counts 26 compared to 100 in gu or hammer. As a low carb runner, you can use carbs to boost your energy during a race to kick your body into a higher gear for a burst of speed or for climbing a hill. You do need to train with this approach because your body needs to learn how to transition back and forth between burning carbohydrate and glucose. The bottom line no matter what you chose to fuel your body with while running is to TRAIN YOUR BODY TO USE IT.